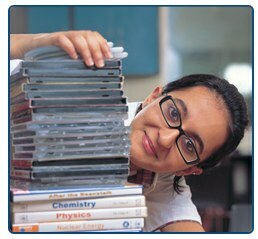 Located in an exclusive block, Library-Media centre at Scottish High International School is the cynosure of all eyes. This exclusively and imaginatively designed air-conditioned Library-media centre is fully computerized and all transactions of book issuing are conducted in automated form with bar coding. It forms the core of every student’s academic progress. The students are encouraged to make reading a habit by allocating sufficient time for the students in the programme schedule. The collection, facilities and the ambience here suits the reading tastes of children of different age group. The library has a wide range of meticulously selected collection of books on all subjects, journals, magazines and periodicals. Excellent study materials, reference books and question banks are compiled for the benefit of senior students preparing for competitive examinations. Book for Lifetime is a novel concept conceived to develop an emotional bond between the student and the school through contribution of books as memorabilia. Scottish High intends to sow the seeds of scientific temper and mathematical skills, in the minds of the students right from their impressionable age. It has developed separate and full-fledged labs for Physics, Chemistry, Mathematics and Life Sciences, as these subjects are not only based on theoretical learning but practical applications as well. The curriculum at Scottish High International School helps the students to develop science skills through keen observation in the areas of scientific theories, life processes, materials and their physical and chemical properties. Students are given proper demonstrations and are expected to conduct these experiments as stipulated in their curriculum. The students are taken out on field trips for plant collection for their herbarium. Innovatively designed full-fledged Math lab makes learning this subject interesting and simple. Today, all over the world, Information and Communication Technology (ICT) has become an integral part of the lifestyle. Scottish High integrates ICT into the curriculum, with the state-of-the-art computer laboratory that has latest hardware and software with high-speed Internet connectivity. There is a very healthy student system ratio of 1:1. Faculty assists the students to brows the Internet in a filtered way to gather information relating to their subjects, projects in hand and also to update their knowledge. 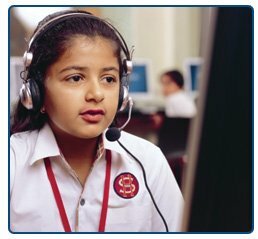 Language labs at Scottish High International School are very handy as students coming from different countries initially find communicating difficult. There is also an exclusive digital library wing attached to the technology lab that has a collection of educative and informative CD’s on various topics. Students can utilize them for their reference in their project works. By using the login ID and password, parents can access student’s information online and note their wards progress by logging on to the school website, thus being aware of their child’s activities on a day-to-day basis and being actively involved in the child’s progress.